Boilers are one of the largest capital expenditures in the industrial utility arena. If it shuts down, so does the profitability of your facility. Here are 10 essential parts to maintain proper boiler maintenance allowing you to avoid a boiler shutdown. If your facility needs the boiler to run, these parts should be on hand to get the boiler back online quickly in the event of a device failure. Gage Glass – A device that allows the operator to visualize the actual boiler water level. The water level seen through the gage glass is compared to the mark on the boiler body indicating the desired normal water level. Gage glasses should have no ‘dead spots’ or webs that can prevent the water level from being identified. The water level in the gage glass should always be clearly visible to the operator. Gage Glass Maintenance – Gage glass should be drained daily. Over time, solids from feedwater can occlude the view of the water level in the gage glass or plug piping connecting the water column to the boiler. Clogged bridle pipes, leaking valves or leaking gage glass packing will prevent the gage glass from reading accurately. Blowdown the gage glass and water column daily to ensure these are reading accurately. Compare the gage glass level to the control system level (if applicable) to ensure these level devices are working appropriately. Replace cloudy, dirty or etched gage glasses to ensure clear water level visibility. Flame Scanner or Flame Rod– Confirms that the burner is firing and looks at the pilot and main flames to determine their intensity. Flame monitoring is an important safety device as improper flame detection could cause the boiler to feed fuel without a flame. This could lead to a gas explosion. Flame Scanner Maintenance – The flame scanner or flame rod should be checked monthly, cleaned and serviced if necessary. High Gas Pressure Switch – When gas pressure rises above the boiler’s operating set point, this ensures the burner is not over-firing and creating a dangerous fuel-rich condition. Low Gas Pressure Switch – Indicates the proper amount of gas supplied to the burner to attain full input and correct velocity through the burner to allow proper mixing. Running a boiler too lean could lead to flame failure. High and Low Gas Pressure Switch Maintenance – These switches should be verified regularly during maintenance by a qualified service technician. Primary Low Water Cutoff – Controls feedwater introduction. If water levels drop too low in the boiler, the valve will shut down the burner. When water level recovers, the boiler may cycle back on. Auxiliary Low Water Cutoff – Serves as a backup for the primary low water cutoff and trips at a lower level. If this switch cuts the burner, a manual reset will be required by the operator to restart the boiler. Primary and Auxiliary Low Water Cutoff Maintenance – Check the low water cutoff operation daily and blow down the bridle to remove sediment and scale. Determine that the burner cuts out with low water in the sight glass. If it does not, immediate corrective action must be taken. These low water cutoff devices will save your life. Make sure they work correctly and replace faulty parts. Gas Metering Valve – Provides precise fuel flow control for main fuel supplies. Gas Metering Valve Maintenance – Inspect the exterior of the valve for loose connections or structural damage. If the valve begins to behave erratically, call your mechanical services provider. Check the stack O2 reading (if your boiler is equipped with a sensor) and log this daily. Stack O2 drift may indicate a problem with the fuel system. Air Pressure Switch – Ensures the fan is operating appropriately and that waste gases are being expelled before allowing the boiler to fire up. If the fan is not operational or a damper is stuck shut, it will prevent the boiler from igniting. Air Pressure Switch Maintenance – This port should be kept clear and clean. This switch should be verified regularly by a qualified service technician. Safety Shutoff Valves and Actuators – When upstream pressure exceeds a defined threshold, the valve activates and automatically releases pressure. This remains fully open until the boiler pressure reaches a pre-defined, safe lower pressure. Safety Shutoff Valve and Actuator Maintenance – Annually replace or send out for recertification to a qualified safety valve repair shop. Ignition Transformer – A high voltage transformer creates the spark necessary for burner ignition. Ignitor Maintenance – Keep it clean by wiping dirt and oil from the surface. Regularly check insulator bushings to ensure they’re clean and not cracked and that the electrode springs are properly aligned. Preventative maintenance is key to avoiding facility shutdown and loss of revenue. Servicing these 10 crucial parts to your boiler will keep it going for the long haul. 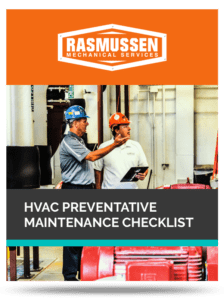 Rasmussen Mechanical Services is here to assist with your regular boiler maintenance needs and can get quickly your facility up and running with equipment available for rent. Contact us today! Subscribe to our monthly maintenance insight series! Receive offer advice on how to identify pain points, troubleshoot problems, when to call Rasmussen, and what maintenance practices you can do on your own to avoid unexpected expenses.